Sprawling and trying to stay true to the character of the original book that inspires and informs it, On The Road eschews an easily identifiable, visible structure. The film is very much character-based, and, at least for about two-thirds of it, meanders around New York, California, Denver, and the US countryside, obediently following the chaotic and impulsive paths of main characters Sal Paradise, Dean Moriarty and Marylou. I’m sure there is a three-act structure hidden in there, but the only clearly present act is the third one, where the main relationship and underlying conflict (Sal vs. Dean) comes to a head. For a film with a subject matter with such potential for conflict, the resolution is not too dramatic, but this somehow feels right, once you’ve accepted On The Road for what it is. Bringing such an iconic piece of literature to the screen is bound to be impossible to please every critically-awaiting fan. Sal’s goal is to write a great book – and we all know what that book came to be, so the following the goal fulfillment throughout the film happens with ease. A degree of predictability cannot be avoided, as we also pretty much know how this goal will come to be achieved. Sal’s main conflict, to me, seemed to be with a person (Dean Moriarty) but at the same time quite internalized. Sal adores Dean, theirs is a true friendship, and he can’t help but keep searching for Dean’s company, and following him on his crazy trips. There is the desire to experience good times with a young, free-spirited and inspiring friend; there is the temptation of an unbounded life away from his traditional family; there is Sal’s sexual attraction to Dean’s on-and-off girlfriend, Marylou; and there is his quest for true inspiration for his writing – a quest both overriding and casually neglected on his whirlwind travels. At the end, living through and acting out (over several years) his main conflict, turns out to be the only path to achieving his goal. There is not much drama associated with it, though our hearts eventually stay with the doomed character of Dean Moriarty – and I believe that was the director’s point. Dean is justified and his legacy is saved, though, going irreversibly down, he himself does not realize it. The film touches upon multiple themes – friendship and loyalty, the impossibility of the struggle against the system, (the ubiquitous one of) coming of age – and outgrowing dependencies and people, the desire to achieve one’s potential. It seems to me, however, the it is the latter two that concentrate the film’s central question: will Sal eventually be able to find the Holy Grail – to complete his literary masterpiece? And since we know the answer in advance, the question is modified as “how” rather than “whether”, which dilutes the dramatic impact of On The Road. This is probably an inherent challenge when creating a biographical film, especially about a well-known person or event. But just think about 127 Hours as an example of a film that is by default stripped of its greatest mystery, but which manages to be extremely fresh and surprising as it tags along its true-story event line. To be sure, 127 Hours benefited from a great acting performance (by James Franco), and On The Road can boast some impressive turns as well. 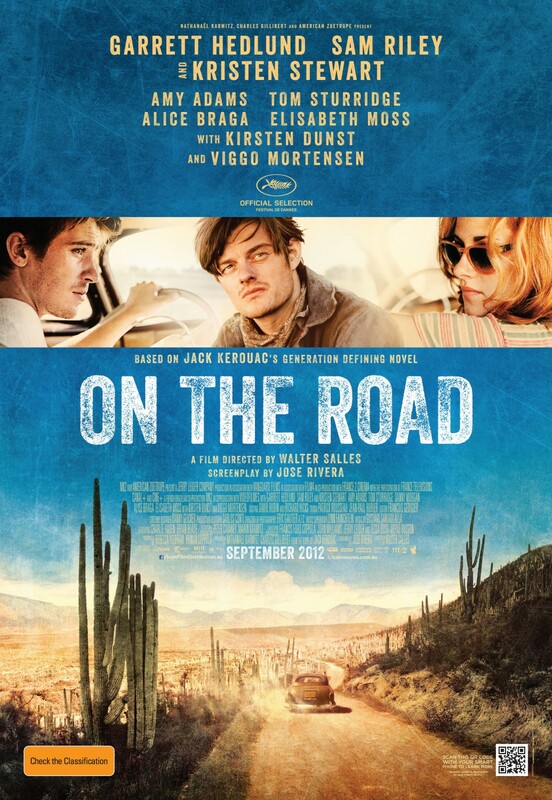 Sam Riley (Sal) is a believable incarnation of Kerouac (though I somehow imagined a wilder figure), Kristen Stewart entices in the time she is given, and there are plenty of star-power peppered on top of the film through the cameos of Kirsten Dunst, Viggo Mortensen, Amy Adams (wished she was given more, as I really respect her as an actress) and Steve Buscemi. But the top performance is that of Garrett Hedlund as Dean. And it’s exactly this performance – vulnerable and bold – that underlines probably the film’s greatest lack. I waited and waited for the characters and events to get crazy, to finally brim over and unleash themselves on me, grab me by the throat and take me not only on a road trip, but on a real ride. Instead, I was lead on respectfully by the hand. On The Road is still an enjoyable, visually impressive walk, but it could have been – and probably should have been – something more.